It's 10am on a Sunday morning and the concourse of Connolly Station looks like a Christmas parade. We don't even check the departure board; we just follow the novelty jumpers, elf hats and hairbands with antlers and baubles through the ticket gate and onto platform four. A brass band is playing Jingle Bells. Eight vintage carriages are lined up, doors open, windows hung with tinsel. But like many of the other passengers, we walk to the end of the platform and peer down the line, waiting for the engine to arrive. When it does, puffing, hooting and blasting out heat, it's met with unconditional admiration. "Look at the coal," the adults say, pointing to the heap in the bunker. "Do you see the coal?" Our kids are almost as mesmerised as we are. The two-year-old stares, unblinking, as though trying to find a word for what's going on. The five-year-old locates his shockproof camera and begins taking photos of the steam. 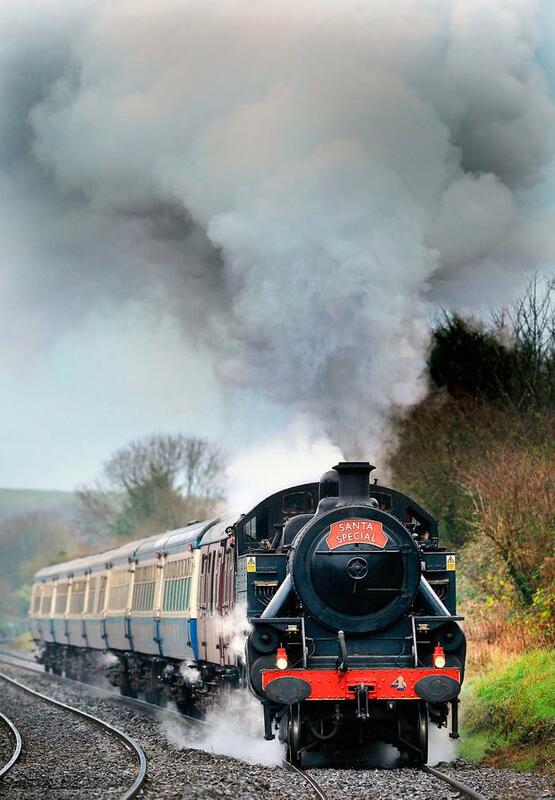 It's an instinctive response - most of the adults are holding up their phones - and the urge to capture a steam engine's presence is something Irish Independent photographer Gerry Mooney understands well. For Gerry, though, there's a serious and formative link between trains and photography. When he was a child, his dad, Liam, would bring him to the railways, camera or cine camera at the ready. It was partly to get the young Gerry out of the house - his brother Paul, who has since passed away, had cerebral palsy - but it also gave father and son a chance to spend time together. Liam would know in advance where the steam trains run by the RPSI - the Railway Preservation Society of Ireland - were due to pass. Mentally, he'd assess different vantage points, working out where the best light would be. As time went on, Gerry was allowed to film or shoot the trains. When he was nine, he bought his first camera - a red Hanimex compact - with money he earned from cutting grass on his local estate in Killester. "I was always around the railway," Gerry says. "I was a pest. I was everywhere. I was always trying to get the picture that was a little bit different. That's still my thing." On the excursions, a certain amount of Liam's energy went into making sure his son didn't go missing. It wasn't unknown for Gerry to disappear only to reappear, waving at his dad, from a train pulling out of the station. As soon as he was old enough, Gerry started working with Irish Rail in the dining cars during weekends and school holidays. His wages funded his photography. At the same time, his interest in the mechanics of steam engines was growing. These days he's an award-winning photographer - he was awarded 2017 PPAI Press Photographer of the Year - and, like his father, he's also a long-serving volunteer with the RPSI, an all-Ireland body with bases in Dublin and Whitehead, Co Antrim. As well as organising tours during the year, every December the RPSI runs Santa Trains from Dublin to Maynooth. Social media plays a big part in the society's profile and, this year, 17 Santa Trains - between them carrying almost 7,000 passengers - sold out online in 20 minutes. Our carriage is alive with the chatter of big and little people. Brian Kinane used to go on the Santa Train with his father - a steam and model railway enthusiast - and this year has brought his three children, Alannah (6), Cian (4) and Saoirse (2). In the seats next to us, Rory Murray, aged 2ƒ, has brought his parents and younger brother, Hugo. "Rory is obsessed with trains," his mother, Niamh, says. "Thomas the Tank Engine has a lot to answer for." Not long after we leave Connolly Station, Santa and his two elves arrive armed with selection boxes. In real life the elves are Shannon (13) and Lisa (11) Hoey, and today they're helping their dad, Martin, an RPSI volunteer, dispense his stacks of chocolate. They're followed by their brother, Patrick Hoey (15), and John Richardson, who is wearing a straw hat wound with blue string lights, and a hand-knitted jumper emblazoned with James from Thomas the Tank Engine. John has been volunteering with the RPSI for 53 years and this morning drove to Dublin from Carrickfergus where he lives. A former bank manager and a magistrate with the family court, he organises raffles on the trains, buying lots of the prizes himself. When he was a bank manager, he says, people used to come to him thinking they'd be content if they had a bigger house or car. "I realised it's not that that brings contentment," he says, "it's giving. And the more you give, the more you get back and that's true of life in general. It's not bound up in property values or share certificates or cash in the bank." As we go through our animal-picture tickets - Donny the Deer, Molly the Mouse, Crafty the Cat - John "finds" our winner. The boys get a Thomas book each; I get a chocolate orange. We chuff along the Royal Canal, settled into the pace of the train. Somewhere near Clonsilla a dog jumps into the water. From the tow-path its owners wave at us and hold up their phones. The two-year-old climbs onto his seat and tries to pull the tinsel off the window. We get stuck into the chocolate, the five-year-old absorbed in his Thomas book. Musicians with guitars come through the carriage and serenade us with 'Rudolf'. In order for the Santa Trains to run as smoothly as they do, a huge amount of work goes on behind the scenes; from getting the carriages ready, to organising the crews, to sourcing the right coal, to preparing the engine. The night before any steam trip, the boiler has to be lit and monitored, meaning somebody has to stay with it. Each locomotive has its own personality, says Gerry Mooney. "They are kettles but they're massive and when they're finished boiling they turn into power stations on wheels. So, behind all the nice shiny paintwork there's a very serious side to this." RPSI trains operate to the same standard as Irish Rail. Gerry is one of the society's locomotive officers. His work with the engines is in total contrast to his day job. "When I'm on the train or around the locos, the pressure of deadlines switches to the pressure of steam," he says. Throughout the year, the RPSI carries out restoration and maintenance work on the engines and carriages, which are housed in Connolly sheds and Inchicore Works. While there are some paid staff in Whitehead, the society relies on volunteers for 96pc of what it does. On our train there are two stewards in each carriage, among them Liam Mooney who is about to turn 82. Like many of his fellow volunteers, Liam was disappointed when steam travel ended in Ireland in the early 1960s. The RPSI was founded in 1964 and he joined soon afterwards. He and his wife Ann are very proud of Gerry. He could tell from early on that his son was a talented photographer and remembers the planning that went into setting up the shots on their early excursions. "Some very good photographs were taken in some very difficult positions," he says. Though photography has changed a lot since his childhood, Gerry still applies the lessons he learned with his dad. "Shooting on cine film you had three minutes on a roll of film," he says. "You had to think about what you were doing. That stuck with me when I started taking pictures. The basics of photography have stuck with me all the way through." In Maynooth, people watch our train from the footbridge, holding up their phones. I stroll through the train, sliding open the doors, passing seats with lovely fabric, the dining car and an impressive bar where four pints are settling. We pull out of the station. The musicians return to our carriage with 'I Saw Mommy Kissing Santa Claus'. We chug back along the canal, the two-year-old singing all the way. When we arrive in Dublin none of us want to get off. At 22, engineering graduate Nicky Cox is one of the RPSI's younger volunteers. "It was really Thomas the Tank Engine that started the railway interest," he says. But he also grew up in Greystones and, as a child, used to see RPSI trains passing by. When he was 14, he went on a steam trip and afterwards emailed the society expressing interest in becoming a member. "They said for legal reasons you either had to be 18 or accompanied by an adult, so I waited and applied for membership and started volunteering the second I turned 18. I was really looking forward to getting started as soon as I could." Like most volunteers, he started off stewarding in the carriages. Nowadays his work with the RPSI tends to be with the locomotives, carrying out maintenance work and looking out for defects. The weekend of our Santa train trip he's pulling two all-nighters, babysitting the engine in the original locomotive shed in Connelly Station, which has been restored by the RPSI. Some of his friends find it hard to understand such dedication, asking him why he'd want to "get filthy and be absolutely wrecked after a night of doing that?" But the oil and soot dirt are "kind of like a signature that you've done your bit," he says. As well as the RPSI, he volunteers with Talyllyn Railway in Wales, the world's oldest preserved railway. His passion for trains is more than a hobby. "It's like a second job at times," he says, "but it's not a chore." One day, in his previous incarnation as a commercial rep with Smurfits, Fergus McDonnell was traveling on an RPSI train. He saw a volunteer struggling and offered to help. That was about 20 years ago and he's been involved ever since. "Promotion is rapid in the RPSI," he says. He retired four years ago but his role as commercial manager with the RPSI keeps him busy. 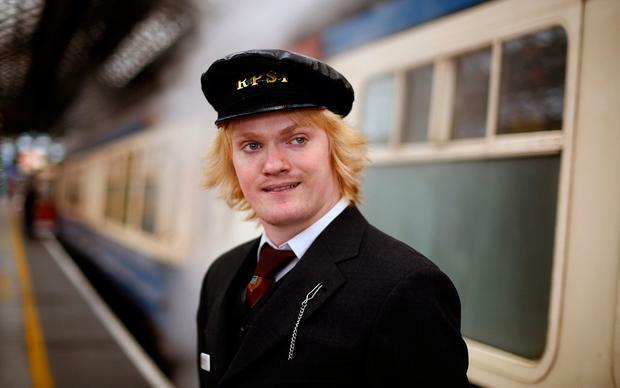 He looks after the train's bar and kitchen, ticketing, train hire, and stocking the train before trips. This year he has organised 3,800 selection boxes for the Santa Trains. "My house is given over to the RPSI," he says. "In my room upstairs are 210 dozen mince pies and in my garage there are 200 bottles of mulled wine." The RPSI runs trips throughout the year and gets involved in several festivals, but the Santa Trains are its biggest undertaking, he says. "The money we make on this pays for our public liability insurance because before we move a wheel we have to find an awful lot of money." There is a degree of stress involved in what he does. "I do worry about things all falling into place, that things don't go wrong and people enjoy themselves." But he gets huge enjoyment from seeing the expressions on people's faces when the steam train passes by, and from traveling on RPSI trains. "I just love the smell of steam and the sound of steam and the look of steam," he says. Railways are in Joe McKeown's blood. His father was a chargehand fitter on the Great Northern Railway and later, when the GNR closed down, a fitter in CIE in Inchicore. A retired garda superintendent, McKeown got involved in the RPSI in the late 1970s, starting off in carriage restoration and becoming operations manager about five years ago. His job involves a lot of paperwork and includes organising the crews for the steam trips. He's also the one who liaises between the RPSI and Irish Rail, whose assistance is crucial to the society. "We do a risk assessment every time the train goes out," he says. "We have to roster stewards for each of the carriages... make sure the carriage inspections have taken place." As well as being operations manager, he goes out to Inchicore Works a couple of times a week to maintain and clean the carriages. "We have guys who wouldn't be railway enthusiasts," he says, "but they come along. It's like their manshed. They're all putting their day's work into it and they love it and they love sitting down and having the coffee when we're having the break and then back to work again." Seeing a steam engine in motion, he says, is very different from seeing it on a plinth. 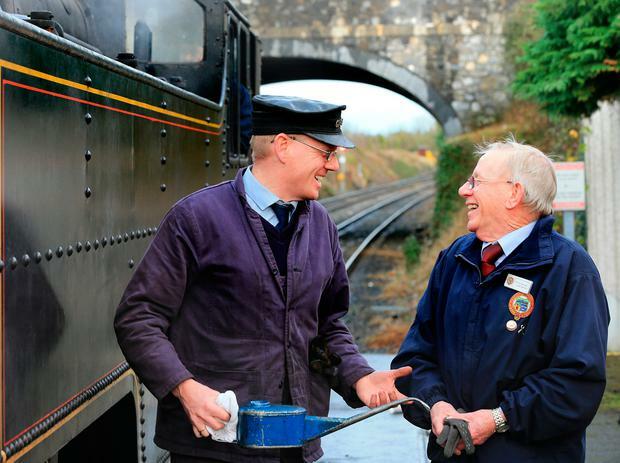 "We're a group of people who are preserving railway heritage, railway history. We consider ourselves a travelling museum."